Global warming has started taking its toll in the least expected scenarios. The increasing cases of pachyderms going berserk and killing people during temple festivals (poorams) in Kerala is a direct result of increasing heat conditions. Among the most beautiful geographies in the world, Kerala is definitely one that is going to be most affected by this global phenomenon. Shape of land and its long coastline make it particularly vulnerable to the vagaries of nature. And when weather and geography of a place is affected for long, the cultural aspects must also undergo corresponding changes. A rigid attitude on the part of people against such natural challenges that are beyond human control can only lead to deterioration and destruction of society. People of Kerala (Malayalees) face the immediate prospects of a major adjustment in vital elements of their culture to withstand the impact of Global Warming. Kerala is blessed with an abundance of forest and forest wealth including wild animals. In addition to the high density of human population, it is also home to a large population of domesticated animals. Perhaps no other state in India has so many of elephants domesticated for helping man in heavy works. The widespread usage of such domesticated elephants in temple festivals must have originated as a remunerative engagement for them during off-seasons when there is not much of work for these giants which are costly to maintain. But now it is difficult to imagine any festival in Kerala without the presence of at least a few decorated elephants. As one of the top ten tourist destinations in the world, Kerala is the land of backwaters, elephants and Ayurveda for all the tourists. But it is time to change. We can ignore the ghastly scenes of domesticated elephants tearing apart human beings like pieces of paper only at our own peril. Images of ‘Trichur Pooram’ with scores of decorated elephants amidst an ocean of humanity swinging to the tunes of dozens of drummers brings pride to the minds of each and every Malayalee. Aggressive marketing of the tourist potential of God’s Own Country has brought such images to every nook and corner of our world, and thousands of tourists flock to Kerala every year in time for this mega event. 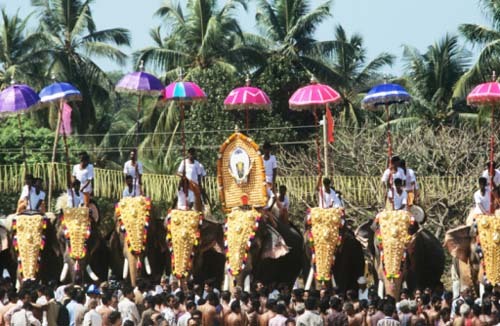 Time has come to disassociate the legendary ‘Trichur Pooram’ from the magnificent elephants. When temperatures are raising it is a great risk to parade such unmanageable creatures amidst tens of thousands of people. It is not only a direct threat for the humans, but also unpardonable atrocity against speechless animals. As the icon of Kerala festivals, Trichur Pooram provides the right choice to trigger a cultural reform which has become inevitable..
Live elephants must give way to their robotic look-alikes. The presence or not of live elephants does not affect the overall conduct of Trichur Pooram and all fans & well-wishers will soon get adjusted to such a change in keeping with the need of our times. It is not only the duty but a right of this grand festival in the cultural capital of Kerala (Trichur) to take the lead in such cultural reforms. Festivals must reflect the essence of our happiness and rituals the symbolism of our reverence to the all powerful Almighty. Sparing elephants the ordeal of standing still for hours together in hot sun (which is getting hotter every year) and taking positive steps for prevention of loss of precious human lives will only make Almighty happy. Descendents of Adi Sankara can feel proud in taking the lead again. Reforms indicate vitality and religious or cultural reforms are signs of liberal thought in action. During these times of rigid fundamentalism, it will only highlight the openness of Sanatana Dharma once again. Every opportunity has multiple dimensions and it is up to the prudent to use it sensibly. Replacement of live elephants in temple festivals by their look-alikes will throw up a vast opportunity for development of robot elephants. Religious rituals which are often divorced from science and technology are seeking a direct help in this regard. Indian Robotics is getting a golden opportunity to bring Science & Technology for direct use in religious and cultural affairs. At least a portion of the vast amount of temple wealth can be diverted for development of technology in our own country. Our ancient rishis were not only good in theology but in science too. Thus it will be a return to our old glory if electronic & IT engineers can also become a part and parcel of our temples. Robotics is one of the most wanted technologies in the present day world and it is indeed a God-sent opportunity if its development gets sponsored by the temples of Kerala. The usual exhibitions associated with Trichur Pooram can become the showcase of our developments in robotics every year. Mimicking of elephants can become a good short term objective for the competitors in this field and scope for further developments in the field of robotics are endless. Healthy competition is a component of all temple festivities and the same spirit in the field of ‘Temple Robotics’ (robotics for use in temples) will definitely place Sanatana Dharma in the forefront of modernity once again. Animals are not integral to any current ritual that is part and parcel of Sanatana Dharma. In very olden times, there might have been animal sacrifices and related bloodshed, which were believed to be forms of sacrifice. But our rishis soon realized that proxy sacrifice is no sacrifice and true sacrifice lies in sacrificing one’s own comforts or life. Ishwar is equally present in everything, and killing or harming anything else, even symbolically for one’s own benefit is useless and counter-productive. Thus no elephants are must for any temple ritual or festival, and are to be avoided if it is a torture for them. Robotic elephants can easily take the place of these loveable animals and yet provide the same level of entertainment to our festivals. In any case, our festivals are our identity and they must go on.